Research has found that most people’s moral foundations are in place by age nine, and a person’s spiritual beliefs are generally set by around 13. We have big work to do with our little ones. These early years are so important. As parents, we are the most important teachers our children will ever have. Our job requires creativity, perseverance, conviction, and lots of prayer (not to mention coffee). 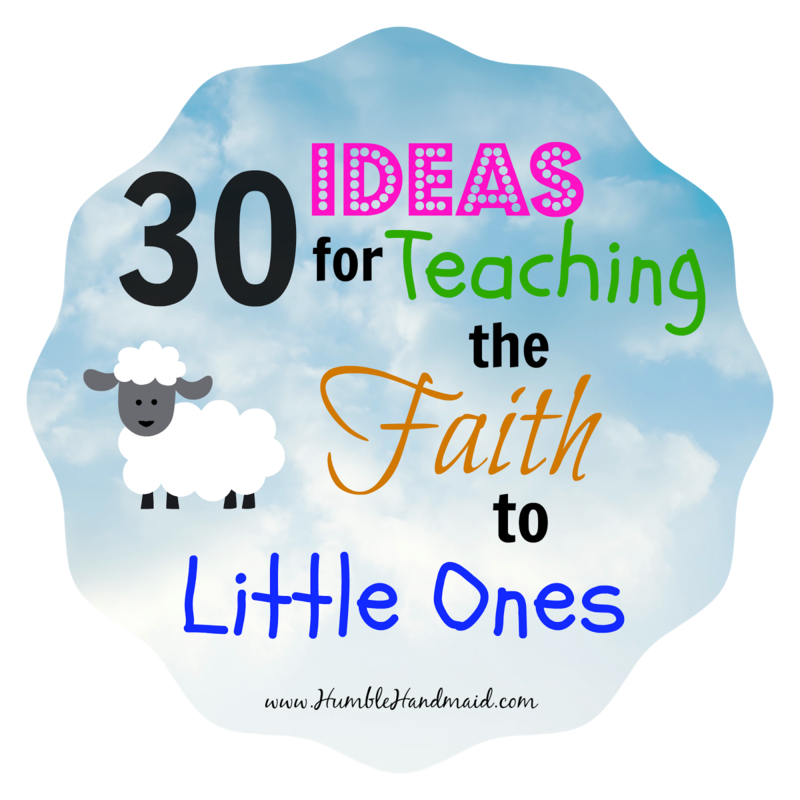 If you don’t know where to start with sharing your faith with your kids, or even if you have a few good ideas already, this post is for you. Here are 30 ideas for sowing those first seeds of faith in your little ones and cultivating a Domestic Church of your own with Christ at its heart. 1. Pray as a family, every day – Yes, it will be like nailing jello to the wall sometimes. Maybe a lot of times. (Have you been to my house?!) But press on with me. Repetition and consistency go far. Don’t become discouraged. Trust that God is multiplying and honoring your efforts. Make a big deal with children over small improvements–and let yourself “count” those small improvements in your own heart. On a practical note, lighting a candle and lowering the lights can really get the kids’ attention. There is still the obligatory occasional fighting over who gets to blow out the candle or sit in Mommy’s lap, but that’s to be expected. :) The Little Oratory has some great practical advice on ways to pray and prayerful traditions for your home. So does this writer. 2. Say a blessing before every meal. And teach those babies the Sign of the Cross. We actually physically hold our babies’ little hands together during prayer, smiling and encouraging them with our eyes while we pray, and we help them to the sign of the cross. Eventually, each of the kids have been thrilled to get lots of praise for starting to do it all on their own–usually around the age of 2. Doing the Sign of the Cross and praying with everyone else makes them feel like part of the family in a new and special way for them. 3. Eat at least one meal per day as a family – Spending time together over a meal cannot be underestimated in maintaining unity as a family. Put the cell phones away, make it a point to really talk to your children. 4. Start by singing – Even the smallest infant loves to be sung to. Sing simply hymns to your baby while nursing or before bed. “Immaculate Mary,” “Amazing Grace,” or “On Eagles Wings” are favorites of mine. We usually sing a song during Family Prayer at night: “I love you Lord” and “Praise God from Whom All Blessings Flow” are two favorites. 5. Celebrate liturgical seasons – Find one or two small ways (read: “don’t be too ambitious”) to celebrate major liturgical seasons. For example, sing “O Come, O Come Emmanuel” during Family Prayer or before meals during the season of Advent. Blogs like Catholic Icing have tons of awesome crafts, activities and ideas for celebrating every feast day, season, saint and Bible story you can think of. For Lent, I make a Crown of Thorns with the kids. We all take a thorn out of Jesus’ Crown of Thorns whenever we make a small sacrifice for Him during the day. My two older children were only 2 and 4 when I started doing it, so I had to make a big effort to keep the sacrifices going for everyone, but since it was all I was doing that first year, I managed OK. The kids seemed to enjoy it, even being so young. 6. Invite children to pray with you all through the day – I often say the Angelus with the kids as I put them down for naps after lunch. If they wake up in time, I invite them to join me on the couch for a quick Chaplet if they wake up from their naps during the 3 o’clock hour. Seeing their mother pray, even just to cuddle with her for a couple of minutes, makes a lifelong impression of what the Christian life looks like day to day. 7. Take a field trip to church – Take a field trip to your church before or after mass or on a special day. Spend time in front of the tabernacle, statues, and special parts of the church. Teach them the names of things, and by your example show them how to be prayerful and respectful. When you go to mass on Sunday, ask each child, “where is the tabernacle?” or “where is the crucifix?” or “Where is Jesus who loves us very much?” Point out the sights, sounds and smells of our churches. Those are things that are meant to engage us in every way in contemplating our faith. 8. Find Catholic coloring pages and books – Again, there are tons of places online with great (free!) printables. You can also check out the selection of coloring books on the life of Jesus at Holy Heroes. In fact, to celebrate a special feast day or liturgical season, try just quickly printing out a coloring page you find online and talking about the picture for a minute before letting the kids have at it with markers or crayons. 9. Make a family prayer space in your home – Set up a little table with prayer candle, Bible, some special books, religious statues and rosaries. The Little Oratory is the go-to book for all you Catholic mommas and poppas out there. I’d say it’s something of a must-read on family prayer. 11. Watch religious/Christian movies – Start a collection of wholesome Christian DVDs. Try Veggie Tales, Brother Francis, and a host of other movies made about Bible stories or the lives of the saints. 12. Listen to Christian children’s books and music – I love the “Hide ’em in Your Heart” CD, but there are tons of great music CDs out there. The Catholic family-owned Holy Heroes company is my favorite. They have beautifully-produced audio CDs on the lives of the saints, the Rosary, the Stations of the Cross, and more. Try putting some great audiobooks in rotation as well. Great children’s literature creates opportunities for conversations about good and evil with even young children. 13. Ask for (and give) religious-themed music, DVDs, toys and games as gifts – I know my kids’ grandparents love to have a little direction sometimes! So do I, for that matter. 14. Teach your children how to apologize well – I feel like I have to make my two older children apologize for something all day long some days. A quick (and insincere) “Sorry” is not an acceptable apology in our home. My kids know that the only “correct” apology is, “I was wrong to ______. Will you please forgive me?” And they have to do it respectfully, with eye contact, and no wiggling. So many people go through their entire lives never saying a real, sincere, I-take-responsibility apology. There’s a lot of “I didn’t mean to_______” that passes as an apology these days. Taking ownership for your words and actions is a life skill and a soul-building skill. 15. Teach your children how to be obedient and respectful – Learning obedience and respect for parents’ authority points to obedience to God. In the South (or in my version of the South:), we accept only “yes ma’am” and “yes, sir” etc. When we call a child, he or she must respond with, “Ma’am?”–never a “what? !” Also, we never let the children get away with speaking disrespectfully to us or to one another. We do a lot of “re-do’s” at my house. 16. Don’t hold a grudge – When discipling your children, move past discipline moments quickly–“forgive and forget.” Don’t hold grudges or stay (at least obviously) in a bad mood. Make a point to show little ones that you are wiping the slate clean–just like God does with us. Moving past discipline moments quickly will model for little ones how to move on quickly from those situations as well, especially when they are the ones that have been wronged. 17. Don’t use the words “good” and “bad” to refer to your child – Make sure that you emphasize that a child made a bad choice–don’t refer to the child herself as ‘being bad.’ Praise children when they make a good choice by telling them so. I have already seen in my oldest child that when he feels like he is “a bad boy,” he kind of “gives up” in a sense, and succombs to making even more bad choices. So many adults follow that behavior too: when they feel they have disappointed someone or failed at something, they feel there is no turning back, and they dive headlong into more poor choices. Speak often to your children about good and bad choices. Remind them that good choices make things go well for them and for everyone else, as well as making Jesus very happy. But also make it a point to tell your children that nothing they do, good or bad, could make you love them any more or any less. Speak of unconditional love as often as you can. 18. Pray in the car – Some of my favorite time spent with my kids is prayer in the car. Little children move constantly, so when they are all strapped in and you have them reliably in one place for a period of time…why, use that time well, honeybun! 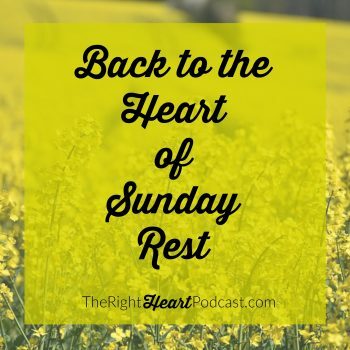 We often end up doing Morning Offering in the car, and we go around and ask Jesus for one thing we need his help with that day, whether it is “being nice to my sister” (usually Gabe) or “patience and gentleness with the kids” (usually me). More car prayer ideas include praying over the sports game or activity a child is about to go to. Before a road trip, stop and pray as a family for the safety and peace of the trip. All we think, say, and do. And the King of my heart. 20. Celebrate children’s saint name and baptism feast days (if they have one) – First, put your family’s special days on your calendar (with reminders, if possible). Then, simply plan for a special dessert or meal that day. You could also just print out a little coloring page to do as an activity that day, during which you talk about the life of the saint and what they teach us about living as a Christian. You could also go all Super Together Mom and buy them a small religious gift. 21. Sneak Scripture into everyday life – Find ways to sneak Scripture into the everyday. If you have a child who often gives up easily on tasks, encourage her with “I can do all things through Christ who strengthens me!” Or when something good happens, make a habit of exclaiming “All good things come from our Father above!” You get the idea. Reading Bible stories aloud at breakfast or lunch has been a good way to give the kids a daily dose of Scripture as well. 22. Introduce them to redemptive suffering – When a child isn’t feeling well, do a little spontaneous prayer to ask Jesus and “Momma Mary” to help him feel better soon. Ask him who he would like to offer up his “sick feelings” for. What a beautiful, simple way to introduce the idea of redemptive suffering to little ones. 23. Say a prayer together when you pass an ambulance – When you pass an ambulance in the car, stop the conversation and say a quick prayer for the sick or injured. Ours is: “Hail Mary full of grace, to the suffering please make haste!” We also say a special prayer each time we see a homeless person. 24. Donate food to the poor every time you go to the grocery store – There is a donation bin right by the exit at our local grocery store. When I remember to, I try to pick up one extra item that the kids can donate on the way out. If possible, I try to let them pick the item themselves. 25. Start teaching your children the Rosary – There are some great ideas out there for teaching little ones about the Rosary. The Rosary is also such a great way to introduce the life of Jesus, since in each mystery of the Rosary we are meant to meditate on an event in our Lord’s life. I have heard, for example, of making little books with pictures of each mystery for children to look at during a family rosary. 27. Kiss the cross – Have children kiss a small cross before going to bed, after Family Prayer, and upon waking up in the morning. Hang it low somewhere in their room. 28. Decorate your home with Christian art, statues, and Scripture – Don’t worry so much that your house is “going to feel like a church.” Decorate in such a way that the people who matter most–you and your family–will be uplifted and inspired by the beauty and presence of thoughtfully chosen and placed religious decor. 29. Bless your children – Before anyone in your family leaves the house for the day, bless them with a short prayer and a cross drawn on their forehead with your thumb. Some families may prefer to also (or instead) bless each child before they go to bed. Either way, blessing your children is a beautiful, intimate tradition that they will keep with them–and treasure–well into adulthood. 30. Grow in your faith–and in your marriage – We cannot give away what we do not have. Continuously seek to deepen your faith, both your relationship with Christ and in your understanding of your Catholic faith. Both are necessary in order to form your children fully in their own faith. If you are married, what is also necessary to form your children spiritually is a mother and father who love one another. Speak well of one another. Show affection. Be playful and silly. Be unified in discipline, firm, fair, and humble in leadership. 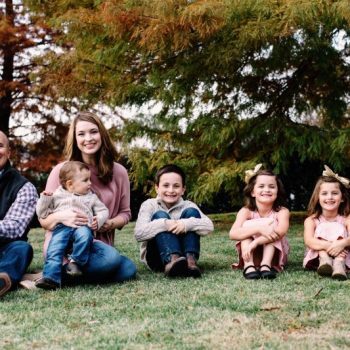 Despite the fact that I wrote this nice blog post with all these lovely ways to pass on my faith to my kids, I don’t do all of these things every day or all the time. There are so many other little habits, traditions and ideas that can help to bring God into our homes and our children’s hearts. But remember that we don’t have to do everything, especially not at first. And “at first” means right now for most of you reading this, including me. If your oldest is under six, it’s likely that you don’t have the bandwidth or maturity level in the kids to “do” more right now. We have to trust that God will guide each of our families to where He wants us to be (which is not always where we think we need to be). Start by doing something little, praying a lot, and knowing that all the small things you are doing really do add up! I love these… thanks for sharing! And I like your Morning Offering better than the one we were saying- we're starting to learn that one now. Hope it's going well with the morning offering. MO is my favorite prayer of the day with my kids…mostly because they are all strapped in to theor seats and can't wiggle and touch eacheck other or run out of the room…etc. 😉 We have such amazing conversations in the van on the way to and from school. Very sweet post! Here's an idea for Advent for your little ones. We did this at school when I was in kindergarten, and I loved it. When your little ones do something good, let them put a piece of straw (or yarn) into an empty crib to make it soft for baby Jesus when he arrives. Thanks for always being so encouraging!